Permission for licensed members of RAST to operate on 80 and 160 metres during contest weekends has been received, those present at the February meeting heard. The frequencies authorised in a letter from the National Telecommunications Commission (NTC) are 1.800 - 1.825 MHz and 3.500 to 3.540 MHz for the 160 and 80 metre bands respectively). Operators should note that the NTC requests to review the logs of stations who take advantage of this privilege and should prepare copies of these logs for submission to RAST at the end of the year. RAST will pass these on to the NTC's secretariat. The two-page letter in Thai authorising this can be found here and here. 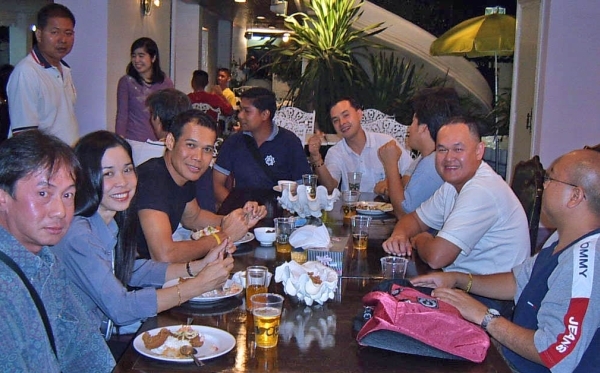 On Sunday, January 8, 2006, some 40 members of RAST and their families gathered at Maj. Narissara (John) HS1CHB's QTH in northern Bangkok to celebrate the New Year. 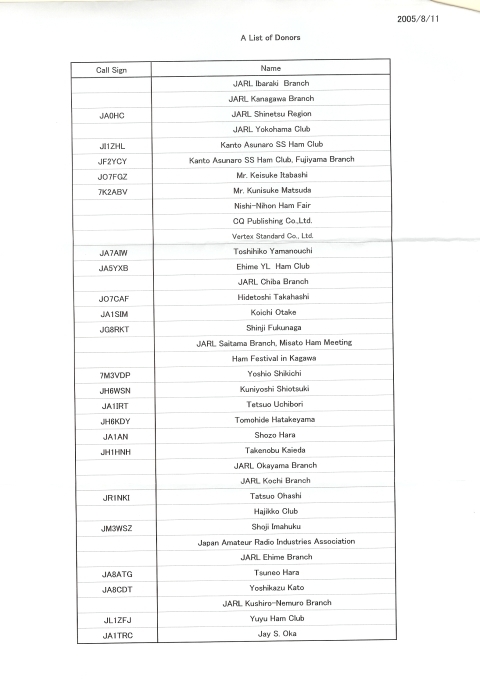 The meeting was in lieu of the regular January meeting, when food, entertainment and beverage was provided, organised by RAST members, funded in part by the auction of a framed 1964 Japanese silk calendar donated by Winit, HS1CKC (and which became the property of Cy, HS0GBI, who bid the most in an auction. RAST is also most grateful to ThaiBev, the brewers of Chang beer, who sponsored a large keg for the evening. RAST President Mrs Mayuree Chotikul gave a welcome address after guests had enjoyed a buffet dinner of Thai dishes during which she reminded everyone of the coming election for RAST officers that takes place every two years in March. She asked everyone present to attend the AGM on March 5 and explained that she did not wish to run again for president of the society, and encouraged everyone to vote for Chaiyong, HS1QVD, who is currently first vice president. Chaiyong then conducted for the auction of the silk calendar, and after that Mrs Mayuree drew the name of the winner in the lucky draw -- whereby everyone who had brought a gift-wrapped present along, received one in exchange. Karaoke and eyeball QSOs continued until late in the evening, while soft drinks and beer flowed. You can also view pictures of the ground equipment used at this website . We thank Dieter Schliemann kx4y, hs0zcn, zs6bbh for the MP3 recording of the contact. Dieter is an ARISS Audio Feed into EchoLink team member who said he was impressed with the organization for the event. Fred, K3ZO, HS0ZAR (centre), flanked by RAST President Mrs Mayuree Chotikul and Narissara (John) HS1CHB stand with several of the recipients of VHF CQWW trophies after Fred made the presentations during the December meeting at Sena Place on Dec 11, 2005. (These and other meeting pictures by HS0ZDX) More pictures. The December meeting on Sunday, December 11 at Sena Place Hotel saw a good turnout when those present were informed that RAST officers Kanchit, HS1JC, Chaiyong, HS1QVD and Uthai, HS1RGF had attended a meeting on national disaster preparedness, joining representatives from various government agencies, in late November. All organisations represented, including RAST, were given one month to prepare a plan of action and to detail who would be ready to stand by and provide assistance in the event of a national emergency. The National Telecommunications Commission, which called the meeting, also stated that in the event of a national emergency that it had the right to commandeer all frequencies as necessary, members were told. Members also heard that six kits to build small NorCal QRP CW transceivers for 14-MHz (one that has been assembled is shown at right) have been donated to RAST jointly by the G QRP Club and the NorCal QRP club that these would be made available to deserving members who would build and operate them. It was agreed by the RAST committee that these would be loaned to members with the aim of encouraging new amateurs to get on the air. RAST would like to take this opportunity to publicly thank the G QRP Club and the NorCal QRP Club for these gifts, which are from radio amateurs in the UK and the USA. Those present also learned that the International Amateur Radio Union (IARU) Region 3 had sent a letter to RAST encouraging the society to seek early access to additional spectrum in the 40-metre band. Under decisions at the 2003 World Radio Conference in Geneva, access to 7.1-7.2 MHz by amateurs on a primary basis is due to be available from March 2009, but the IARU gave several examples of early access to this spectrum made by several administrations, including Singapore in September this year. RAST intends to take this matter up with the NTC and believes that the IARU letter, addressed to RAST President Mrs Mayuree, HS1YL, will help it in making the case for early access to this additional spectrum in Thailand. Permission for low-band operations during contests, applied for on an annual basis for five years now, is due to expire on December 31, 2005 and the society intends to apply early for renewal of this privilege, hoping to receive approval in time for the CQWW 160-metre band contest at the end of January. All members who have operated during contests this year in the 80 or 160 metre bands are asked to submit their logs to Winit, HS1CKC by email to hs1ckc(AT)yahoo.com. QSL cards for operations using the special callsign HS0T issued to RAST for club use and permitting WARC-band and low-band operations in commemoration of the birth of Prince Teepangkorn Rasmichoti to His Royal Highness Crown Prince Maha Vajiralongkorn and Her Royal Highness Princess Srirasmi on April 29 this year are still waiting for Royal approval of the picture to go on the front of the card. This callsign was used during the CQWW CW contest from Koh Lanta AS-035, WLOTA 0946, in Krabi and during a DXpedition there last month. The call was also activated for a special net operation on a two-metre net on December 4, the eve of His Majesty the King's birthday, when well-wishers were able to make birthday greetings and blessings on behalf of His Majesty, HS1A. Thailand is the most active country in Asia when it comes to the CW Magazine's CQWW VHF contest and for the past few years, since activity was encouraged here in the mid-1990's -- and everyone thanks HS1CHB, John, for stimulating this -- a Thai station has come first in Asia. To recognise this a group of RAST members who call themselves the ``Golden Kilowatt Council'' has prepared a special trophy for the winner of the winner of the 2004 contest, E21DKD. At the December meeting, K3ZO/HS0ZAR, Fred presented the Hans Hollstein trophy to E21EIC, Champ, (pictured at right) who accepted the trophy for E21DKD. This attractive trophy will be awarded to the top Thai station in the CQWW VHF contest on an annual basis. Champ, who is one of Thailand's most avid and successful contesters and a big DXer, also brought to the meeting over 10 certificates for CQWW VHF contest winners in various categories. These certificates were presented by RAST President Mrs Mayuree, HS1YL, and Fred, himself one of the world's top contesters and a RAST member for over 30 years and an adviser to the society. Click here to see more pictures. Those attending the November meeting were fortunate to be able to view and hear a presentation by Charly, K4VUD, HS0ZCW, about the VU4 Andaman Island DXpedition last year. Members heard how it was organised and planned, the work that went into building the stations and in operating them, and then what happened when that fateful earthquake shook the region on December 26, triggering the devastating tidal wave. Charly's account was accompanied by a presentation on a notebook computer that those present huddled around to see images of Port Blair and other islands in the Andaman and Nicobar chain before and after the tsunami struck. 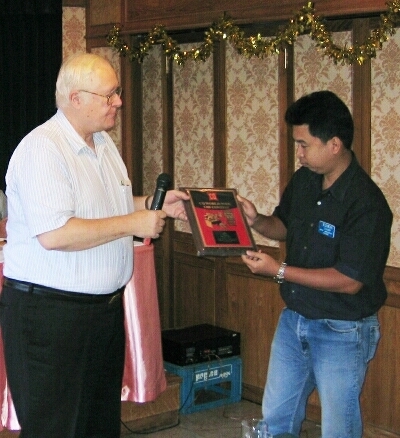 At the November meeting, RAST acknowledged two letters from the Modern International School Bangkok, the first thanking the society for its support of the International JOTA event conducted by the school over the weekend of October 15-16 on its Sukhumvit 39 campus, while the second letter was seeking RAST's support in establishing an amateur radio club station at the school. The school praised the contributions made by John, HS1CHB, who had attended the International JOTA. RAST officers said that they would work closely with Gokul Bhat G. (VU3GBG), a teacher at the school and a RAST member, in support of a club station for the school's students to use. A new club station, HS0AR, has been authorised by the NTC for contest operations at the QTH of E21YDP. The request was referred by the NTC to RAST, which supported the application. HS0AR is authorised to transmit during contests on 10 through 160 metres, privileges that are now available to all licensed HF Thai operators, until December 31. HS0T was active from HS0AC during the CQWW SSB contest at the end of October and will again be activated in a major contest from Koh Lanta, in Krabi province (As 053 or WLIOTA 0496) during the CQWW CW contest at the end of November. Otherwise, HS0T is allowed to operate on the WARC bands until Dec 31. RAST vice president Winit, HS1CKC, explained that permission to operate the low bands during contests had been sought and granted on an annual basis for five years now and that RAST would be seeking for permanent permission to operate on the 80 and 160 metre bands. RAST also intends to proceed with annual requests for WARC band privileges and hopes that these will be extended to apply to all licensed Thailand amateurs soon. RAST has noted that Singapore radio amateurs have been granted an expanded allocation on 7 MHz. Their allocation has been doubled by extending the band by an additional 100 KHz from 7.1 to 7.2 MHz. 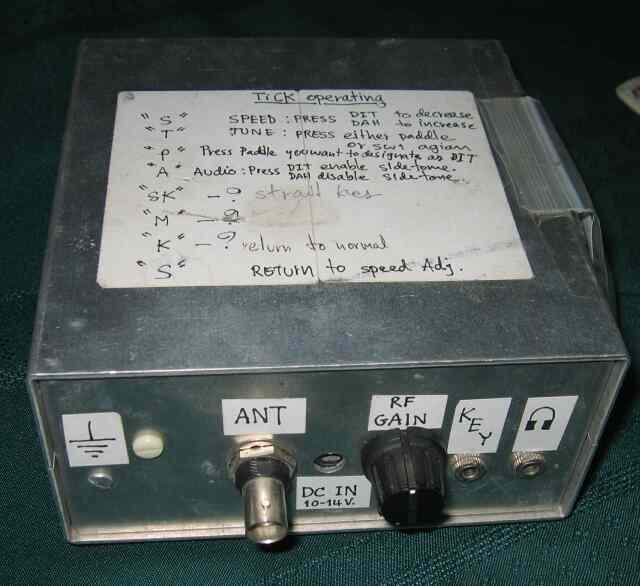 This follows the decision at the World Radio Communication conference in Geneva, 2003, to double the amateur radio allocation in this band, effective from March 29, 2009 in the International Amateur Radio Union's regions 1 and 3. The RAST committee intends to make a case to the NTC for authorising, as soon as possible, similar operations on a secondary basis in Thailand, following this precedent set by the Singapore authority. The National Telecommunications Commission has authorised the use of the WARC bands and low bands (80 and 160 Meters) until December 31, 2005 from the RAST club station at the Asian Institute of Technology (HS0AC) using the special callsign to commemorate the birth of a son to His Royal Highness Crown Prince Maha Vajiralongkorn and Her Royal Highness Princess Srirasmi on April 29, 2005. His Majesty the King has named the baby prince His Royal Highness Prince Teepangkorn Rasmichoti. All members are invited to operate using this callsign from the club station and they should make prior arrangements with HS0AC Station Manager Winit Kongprasert, HS1CKC. The QSL manager for HS0T is HS6NDK, Sonthaya Phanthanyakij, P.O. Box 20, Lumlukka, Pathum Thani, 12150, Thailand. Email addresses of HS6NDK and HS1CKC can be found at qrz.com . 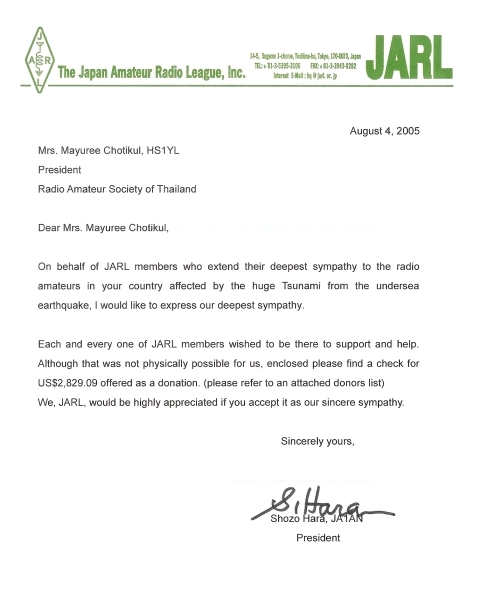 The Japan Amateur Radio League (JARL) has made a second, most generous donation to RAST in its efforts to assist victims of the December 2004 tsunami with a cheque that was received in August to the value of US$2,829.09 (over 116,000 baht). In December 2004, JARL had earlier sent 200,000 Japanese yen (over 75,000 baht) to this cause. RAST President Mrs Mayuree Chotikul, all directors and members of RAST on behalf of the tsunami victims in Thailand would like to take this opportunity to thank JARL President Mr Shozo Hara and the JARL -- and in particular those who have donated funds so generously to this cause -- for their support. Click here for an account of how Thai hams helped following the tsunami wave struck on Dec 26, and of details of the generous donations received by RAST. Earlier this year, RAST donated 500,000 baht to Her Royal Highness Princess Maha Chakri Sirindhorn's charity to assist the tsunami victims, and we have pictures here. A total of 180 delegates attended the 32nd Seanet convention at the Arnoma in Bangkok Nov 19-21, 2004, with over 130 of these being from overseas. The largest overseas delegation was from Malaysia, with 35 attending from East Malaysia (Sabah) and West Malaysia. Japanese hams represented the second largest contingent, numbering 25, while Brunei registered 8 delegates. 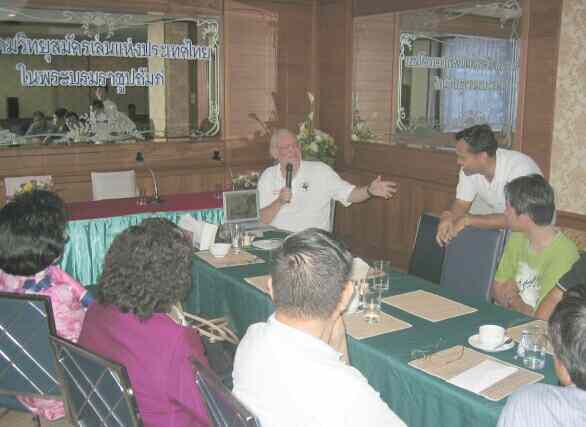 Some 50 Thai radio amateurs and guests participated in the three days of socialising, sightseeing and technical sessions. Ray Gerrard, G3NOM, HS0ZDZ, 64, suffered a severe heart attack on November 11, 2004, while travelling from his home in Nakhon Nayok to Bangkok with his XYL Lawan, E21UHL. After spending over six weeks in a Bangkok hospital, during which time he regained consciousness after being in a coma, he was discharged at the end of January and Ray is now recovering at his Nakhon Nayok home in the care of his wife. Ray is the international vice-president for RAST, and the station manager for the RAST club station HS0AC and HS72B. Please download the membership application form from the link below (it is in Adobe PDF format), print out a copy and fill out the form and bring it to the next meeting -- or mail it to Khun Chaiyong at the address below for a new, ATM-type RAST membership card. The annual RAST New Year party in January was a lively event held in the garden of our president, Mrs Mayuree Chotikul, HS1YL. Here are some photographs and an account of the event.